Alex Rodriguez says he feels less pressure in this postseason. NEW YORK - When you're a Yankee, going to the World Series never gets old. But, when you're a Yankee, getting there means nothing if you don't win. 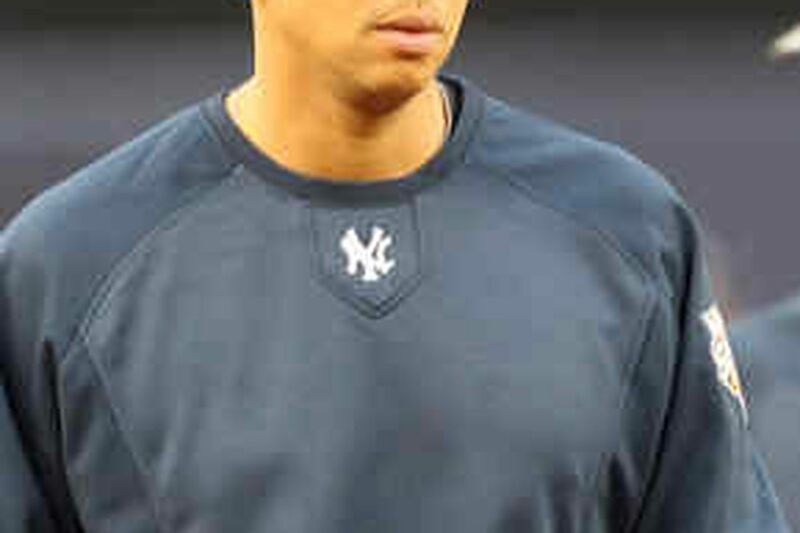 Mark Teixeira and Alex Rodriguez, the biggest names the Yankees ever bought, know this. "We talked about it 2 nights ago," Teixeira said yesterday. We just feel like we're very blessed we're here. Getting a chance to do this. With the Yankees. "The greatest thing about being a Yankee is the expectations. As a team, we expect greatness. If it doesn't happen, we're all going to be disappointed . . . In pro sports, it's the New York Yankees and everyone else." The pair played together in Texas. Rodriguez came to the Yankees in 2004 via trade, then signed a $275 million, 10-year contract in 2007. Teixeira, who bounced to the Braves in 2007, then briefly to the Angles late last season, signed as a free agent in the offseason, for 8 years and $180 million (it was a recession). Teixeira was part of the $425 million upgrade that included free-agent arms CC Sabathia and A.J. Burnett. Money might not buy you love, but it bought the Yanks a pennant. That was the plan, Teixeira said. "It has been kind of a dream season," Teixeira said. "We definitely want to finish it off. No one's going to be excited if we just get to the World Series and we don't finish it off." Last year, Girardi replaced a legend, Joe Torre . . . and managed to guide the club to its first season without a playoff appearance since 1995. He got to watch Torre go to the playoffs, though, as the new skipper of the Dodgers. Even so, just getting to this point means just a little bit more than squat for Girardi. "I'm very proud of what we've been able to accomplish so far," Girardi said. "But as a Yankee, and I think any team, your goal is to win the World Series." Some teams consider it a goal. Others consider it a right. Thanks to the likes of Derek Jeter and Mariano Rivera, the Yankees, with 40 World Series appearances, 26 titles and bottomless pockets, expect to win it every season. That doesn't keep Jeter and Rivera from relishing the moment. "Hey, I appreciated the first one," said Jeter, who as a rookie in 1996, splashed onto the scene with an excellent postseason. "And I've appreciated every one since." Rivera was slightly more experienced in 1996, and he wasn't the club's closer yet. He has since earned the distinction of being perhaps the best postseason reliever ever, if not the best postseason pitcher in history. For him, too, it never gets old: "It is the World Series. This one is like the first one." After being criticized for holding the reins too tightly in his first season as Yankee skipper, Joe Girardi has drawn raves from his superstar cortege for learning from his 2008 mistakes. "He's been phenomenal," Alex Rodriguez said. "He's done things a lot differently this year. He's communicated with the leaders of this team. He's basically let us run our clubhouse." Cryptically, Derek Jeter asserted that former Yankees owner George Steinbrenner, who stepped away from running the day-to-day operations 2 years ago, remains in touch with what happens with the ballclub. "He's still involved, man," Jeter said. "I don't know what info you guys are getting. He's still involved. I can't share what I know, but . . . he's the reason why we are in this [new] stadium. We wouldn't be here if it wasn't for him. We wouldn't have this team if it wasn't for him. I don't care how involved anyone thinks he is." The Yankees won't submit their roster until this morning's 10 a.m. deadline, Joe Girardi said, but the New York Times last night reported that the Yankees would add competent, powerful, lefthanded pinch-hitter Eric Hinske in place of speedy Freddy Guzman . . . Girardi also allowed that he might start designated hitter Hideki Matsui in the outfield in Philadelphia (no DH in NL parks) if Matsui is hot and less hobbled. He has fought left knee issues this season . . . Girardi indicated that CC Sabathia might not be asked to go on 3 days' rest if the Yankees have a lead in the series entering Game 4 in Philadelphia; that he might opt for righthander Chad Gaudin.